R.J. Tilley offers plumbing and remodeling services in the Midlothian, VA area. For over 40 years, R.J. Tilley has served the needs of central Virginia homeowners with high quality plumbing services. During this time, our services have expanded beyond plumbing to include bathroom and kitchen remodeling. Our professional staff includes both experienced plumbers and carpenters. You can trust in us to handle just about any job. Considering a gas conversion? Or, want to install a gas line for your outdoor grill? Our team of seasoned gas fitters are licensed and insured to serve all your gas piping needs. For over 20 years we’ve offered bathroom and kitchen remodeling to ensure our customers are living comfortably. We’ll take care of everything including painting, sheet rock, electrical, flooring, tile and cabinetry. Looking for products and design ideas to use in your kitchen or bathroom remodel? Visit our showroom. If your home is surrounded by mature trees, you could be at risk for root meets pipe. This is when drain pipes may become clogged or start deteriorating from tree roots. Warning signs of this include gurgling sinks and recurring clogged drains. Our team can inspect your drains using optical technology, and devise a cost-effective and permanent method for sewer line repair. Our team knows the role well-maintained, efficient systems play in the comfort and safety of your home. From routine service and installation to emergency repairs—we can fix that! 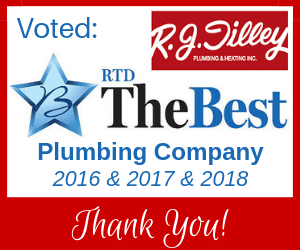 We take pride in being voted one of Richmond’s best plumbers. Read some of our online reviews! For all of your plumbing, heating and remodeling needs, contact R.J. Tilley today.